Thanks in part to Daniel Gold’s recent e-book on Evernote, there has been a lot of buzz about how to use FollowUpThen to get just-in-time reminders about your Evernote notes. (I highly recommend Daniel’s book, by the way. For $5 it’s a no-brainer). Step 3: Type in your FollowUpThen address. Your note magically appears in your inbox right when you need it. 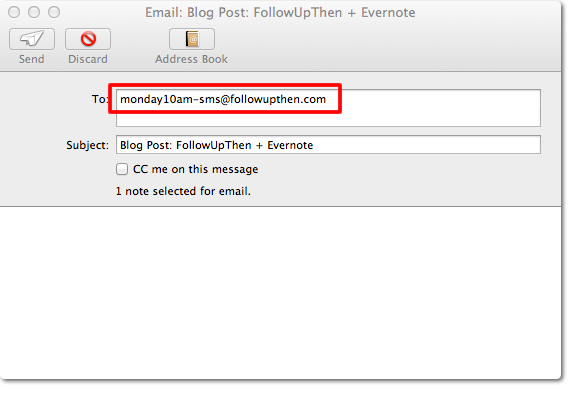 The reason this works is because Evernote, in all of their brilliance, sends the note from your own email address. To us, it just appears you are scheduling a reminder as usual. Being an Evernote enthusiast myself, I was thrilled when the Twitter ecosystem started to go ablaze with that tip. And now here it is for you. Also, here is a link to Daniel’s ebook: Evernote: The Unofficial eBook.